Somehow, despite the fact that I haven’t been grocery shopping in at least a week (it was more, I’m just being modest), I seem to still have a relatively full fridge. I’ve mentioned this before, but I seem to have more difficulty coming up with a reasonable, balanced meal when I have lots of options. Sure, I’ll have some cheese and crackers, followed by roasted veggies and then maybe some pasta! Oh, and I’ll probably crank out some kale chips and a piece of garlicy naan for good measure, right before I eat a few of those peppermint pretzel thins. You know, because they compliment each other. And because I need to use up ALL THE FOOD, obviously. Anyway, I’m trying to keep things under control this week. So I decided that since I’ve got everything I need for a healthy Mexican, vegetarian dinner, that I would just own it and make a fajita/burrito. That would be a wrapped fajita, in case I wasn’t clear. 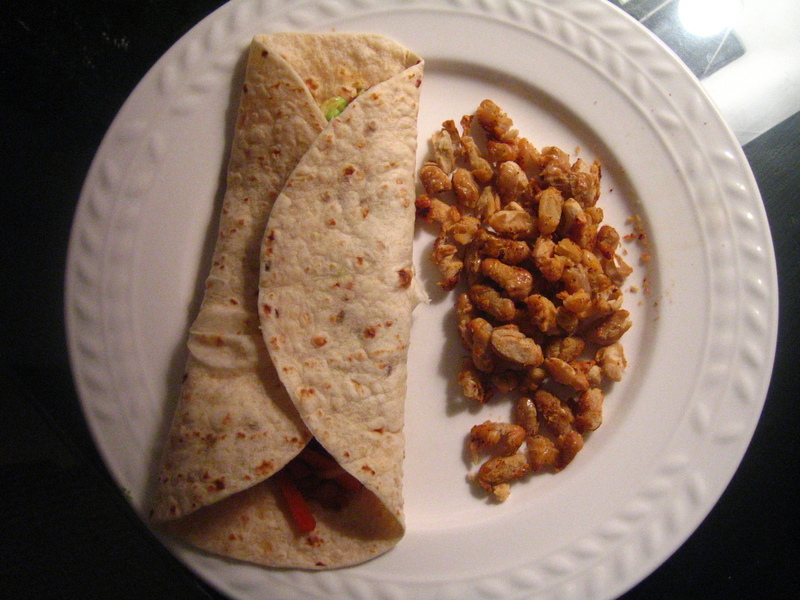 But because I had TOO many options, instead of making a bean and veggie fajita/burrito like a normal person, I roasted the beans on the side. I rinsed a can of cannellini beans and roasted them up (per this method). Then I sauteed julienned onions, carrots and bell peppers with some frozen corn and a few minced cloves of garlic in a little olive oil, put the veggies in a tortilla and topped it with some avocado and salsa. So, it was a deconstructed bean burrito if you will. And it made me feel like I was making more than one dish, which eased my somewhat unbalanced psyche. Plus, it was in line with my new week’s resolution! I might be weird, but I’m accomplishing a lot of goals over here, people. I think I’ll sleep easy tonight. I always feel that way when I buy a lot of groceries – and end up bringing together food combinations I never imagined would go together. That said, I love what you did with the fajita/roasted beans. They look delish! I’m currently in freezer clean out mode which has made dinner a challenge. Especially when I don’t get home from the gym til 7:30 and all i want to do is sleep face down on the couch. Last night was quite an interesting creation, but it did the job. 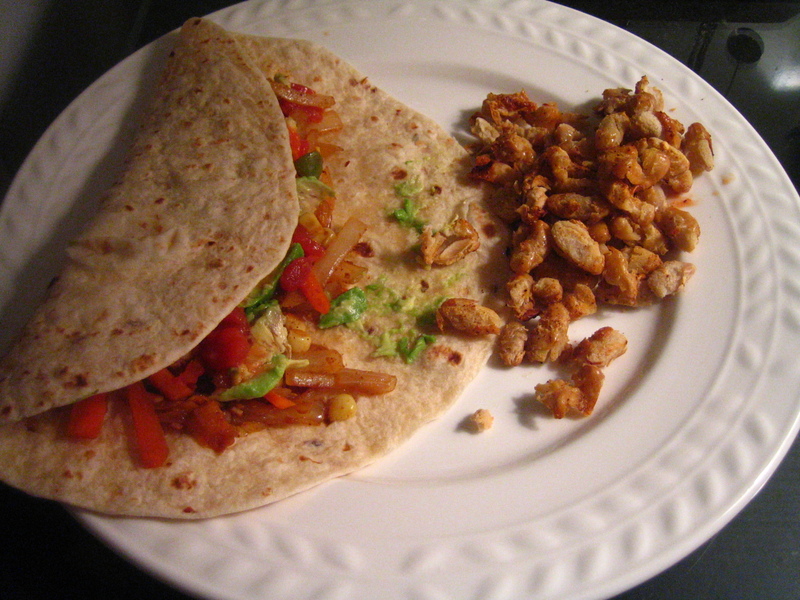 Not nearly as fancy or well-thought-out as your deconstruction burrito! This is a big reason why I buy so few groceries these days. Having too many is just so stressful! The fuller my fridge is, the harder it is for me to decide what to eat. I’m really bad at small decisions though. Trying to pick an ice cream flavor can take me half an hour. Once, the guy at the ice cream place actually made fun of me and said, “it’s just ice cream. This decision won’t change your life.” I maintain that he’s wrong – ice cream CAN change your life, but whatever. Having a stocked fridge both soothes me and freaks me out. Which I realize may seem a little insane, but well, consider the source. Loving the deconstructed burrito. I need more Mexican food in my life.